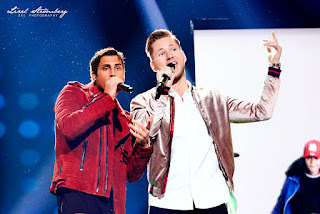 Samir Badran is best known to international audiences as one half of the duo Samir & Viktor, who have competed in Melodifestivalen three times and each time made it to the finals in Friends Arena. With their fun-loving energy and charisma, they have amassed an adoring fan-following but often find themselves the punching bags from Swedish media outlets and other online haters. It's unclear why exactly Samir in particular seems to be so frequently targeted for hateful articles and comments. Although Samir & Viktor's brand tends to be more light-hearted and fun, the deeper theme that runs through all their content is an unwavering push for positivity, inclusion, and acceptance. Samir already had an interest in music before he and Viktor joined up to be a pop-duo, having worked on his own hip-hop content. Following the success of Samir & Viktor's songs, Samir began to release his own songs again, including the hard-hitting "Karma is a B*tch" in which he rapped about the various ways people from the music/entertainment industry have tried to exploit and scam him. Samir puts a considerable amount of thought and effort into his endeavors, whether it's his solo music, the Samir & Viktor releases, or his recent fashion line "You Made Me" that he uses to see items in his own personal style to fans wanting to dress like him. Regardless of the fast-talking, often hyperactive demeanor he is so harshly judged for, Samir displays an incredible level of self-awareness particularly in regards to his harshest critics who believe him to be lazy or stupid, when nothing could be further from the truth.